In the farmdoc daily article of June 7, 2017, we examined the long-term pattern of corn prices during the era spanning from 1973 through November 2006 and the new era that began in December 2006. We concluded that: (1) there is a long-run average nominal price of corn for different eras that tends to emerge fairly early in each era; (2) corn prices revert to the average within each era; and (3) the deviations and reversions to the average price do not occur in a predictable cycle in terms of either magnitude of deviations or duration of the deviations. In other words, we argue that long-run crop prices have a stable average within a defined era and adjust to supply and demand shocks in a classic cobweb fashion. However, the price adjustments do not follow the repetitive cyclical pattern of the classical cobweb model, but rather are highly volatile and difficult to forecast due to the substantial variation in supply and demand shocks over time and the exact market reaction to those shocks. A significant supply shock that can move corn prices away from the average price is U.S. growing season weather. Exceptionally good or poor weather can result in U.S. average yields above or below trend value and result in a “surplus” (“shortage”) of corn that pushes prices below (above) the long-term average price for varying lengths of time. This is especially true when there is a run of good or poor weather over a relatively short time period. The purpose of this article is to examine the historical pattern of weather-related U.S corn supply shocks with a focus on periods with unusually poor or good weather. Understanding these historical patterns will assist in forming expectations about future supply shocks and price movements. Rather than examine historical weather conditions directly, we examine the pattern of U.S. corn yields and yield deviations from trend value as a proxy for weather conditions. Favorable weather presumably results in an average yield above trend value and stressful weather conditions result in an average yield below trend value. 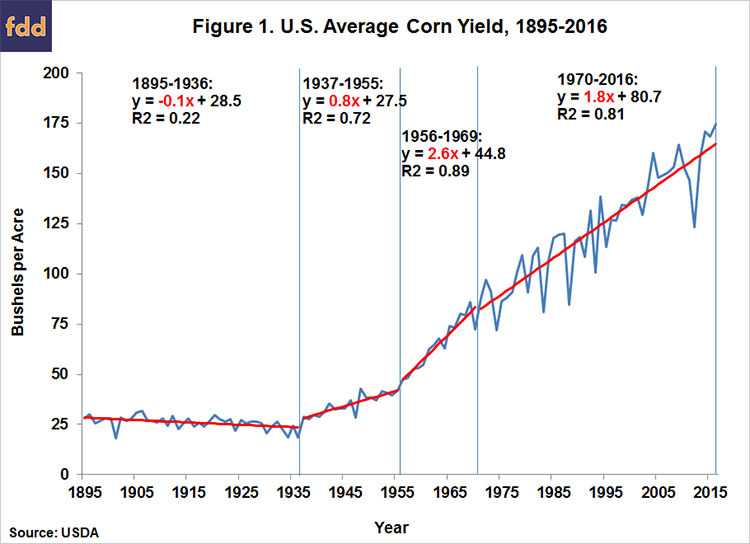 We begin by estimating the trend in actual U.S. average corn yields over the entire period of available data–1895 through 2016. Since corn production technology and management practices have changed significantly over time, we would not expect to find a functional form for the trend that fits the entire 122-year period. As indicated in Figure 1, we estimate a linear trend of actual yields for four time periods delineated by trend breaks: 1895-1936, 1937-1955, 1956-1969, and 1970-2016. The periods are associated with distinct shifts in corn yield trends. Each period contains a myriad of technological and management practices that make isolating a single causal factor difficult. The advent of corn hybrids in the 1930’s provides an obvious cause for the trend break in the mid-1930s. The slope and explanatory power of the trend vary considerably by period, with trend explaining very little of the annual variation in yields in the earlier period, represented by an R2 of 0.22 from 1895 – 1936, and a high percentage of the variation in yields in the latter periods. The pattern of the trend slope estimates is interesting in and of itself. 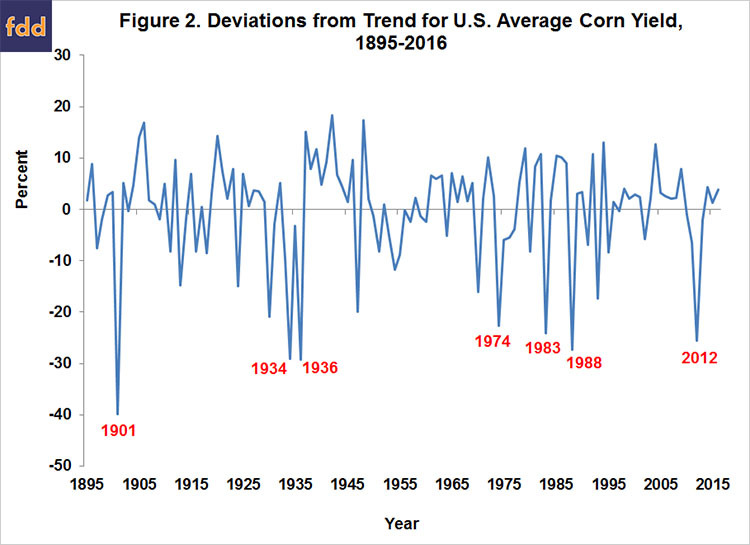 Trend corn yields through 1936 actually had a small tendency to decline, but have risen ever since. The highest annual rate of growth in trend yields, 2.6 bushels per acre, occurred during 1956-1969. The estimation of yield trends is necessary to uncover the information contained in the annual deviations from trend values. Trend deviations provide the basis for analyzing the impact of weather shocks. Those deviations in bushels per acre are apparent in Figure 1. Since yields have increased so much over time, deviations are more informative when calculated as a percentage deviation from trend. Those calculations are shown in Figure 2. The deviations have the following characteristics: (1) the occurrences of deviations above trend (61 percent) exceed the occurrences of yields below trend (39 percent), (2) the magnitude of the extreme negative deviations are larger than the magnitude of the extreme positive deviations, (3) the average of the negative deviations (9.3 percent) is larger than the average positive deviation (6.2 percent), (4) the length of runs of above trend range from one to 10 years and the length of runs of below trend yield ranges from one to five years, and (5) while there is no obvious pattern in the direction and magnitude of yield deviations, there is some clustering of extremely bad weather outcomes, such as in the 1930s and the 1970s and 1980s. An additional feature of the estimated trend deviations is a tendency for the highest positive deviations before the mid-1950s to be much larger than the highest positive deviations since that time. This may reflect a greater responsive of corn yields to exceptionally good weather when “open” pollination varieties were in use or errors associated with the procedures used by the USDA that did not incorporate the statistical sophistication of current estimating procedures. Modern random sampling methods to estimate yields were not fully adopted by the USDA until the 1960s. The challenge now is how to best characterize the historical pattern of runs in corn yield deviations from trend value. One approach is presented in Table 1. Starting with the most recent 20-year period (1997-2016) we first count the number of negative and positive yield deviations for each 20-year period dating to 1897. Those counts are very consistent for each period. It is notable that the 20-year window with the fewest negative yield deviations was the most recent window. Next, for each 20-year window, we calculated the sum of the yield deviations above and below trend. This calculation captures the frequency and magnitude of positive and negative yield deviations from trend. The sums of the deviations vary considerably by time period, with the largest cumulative negative deviation occurring in the 20-year period from 1917 to 1936 and the largest cumulative positive deviation occurring in the 20-year window from 1937 to 1956. The smallest cumulative negative and positive deviations occurred in the most recent time period. The smaller cumulative deviations witnessed recently may partially reflect that deviations are calculated in percentage terms rather than bushel terms. With yields increasing so much over time, there is some debate whether yield variability is best represented by percentage or bushels. Regardless, weather in the most recent time period appears to have been less adverse than in previous 20-year windows. One potential issue with the computations in Table 1 is that the results could be sensitive to the particular 20-year windows selected. Figure 3 presents a count of the number of years with below trend yields for all 20-year rolling widows since 1895. The first window is 1895 through 1914, the second window is 1896 through 1915, and so on to the last widow of 1997 through 2016. 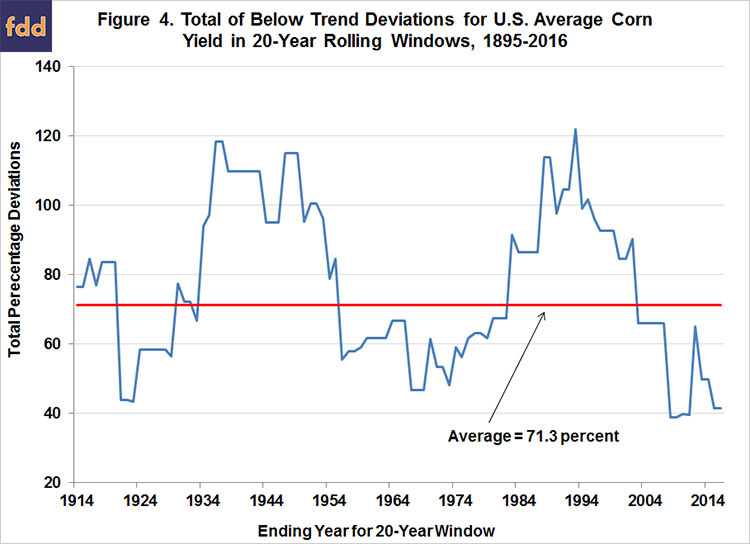 The number of years with yields below trend in those 20-year rolling windows ranged from five to 11 and averaged 7.7 years (39 percent). The highest frequency of below trend yields occurred in the 20-year windows ending in 1964, 1965, and 1966. Yields have been below trend during seven or fewer years in each of the 20-year windows since the one ending in 1996. Figure 4 shows the sum of below trend yields in each 20-year rolling window since 1895 through 1914. This computation emphasizes the magnitude of negative trend deviations not simply the count of below trend yields. Periods with major weather problems, mainly drought, will score highest on this measure, while periods with more benign weather will tend to score lower. The average total negative yield deviation for all of the 20-year rolling windows was 71.3 percent. The sums have ranged from a high of just over 120 percent in the 20-year window ending in 1993 to a low of 40 percent in some of the more recent time periods. The 20-year windows that include the 1930s and 1970s and 1980s have the highest sums of negative deviations because of the major weather problems that occurred during these periods. The relatively low frequency of negative yield deviations and the relatively small sums of negative yield deviations in recent years reflects an extended period of relatively benign weather for U.S. corn production with the notable exception of 2012. In fact, the sum of negative deviations for the 20-year window ending in 2016 is among the smallest of all possible 20-year windows since 1895. This reflects the fact the U.S. essentially has had only one truly bad corn crop since 1996. The only other comparable period of benign weather was the late 1940s through the late 1960s. The recent period of relatively favorable weather for U.S. corn yields, particularly since 2013, has been a major factor contributing to the lengthy period (now 34 months and counting) of prices below the expected average price for the price era that began in November 2006. History suggests that this period of relatively benign weather, generally good corn yields, and low prices will transition to a period of less favorable weather, lower yields, and higher prices. History is less clear about the exact timing of the transition. The analysis of historical corn yield deviations from trend values is useful in forming expectations about future supply shocks and the implications for corn prices. In this regard, it is especially important to understand the nature of runs of unusually poor or good weather. 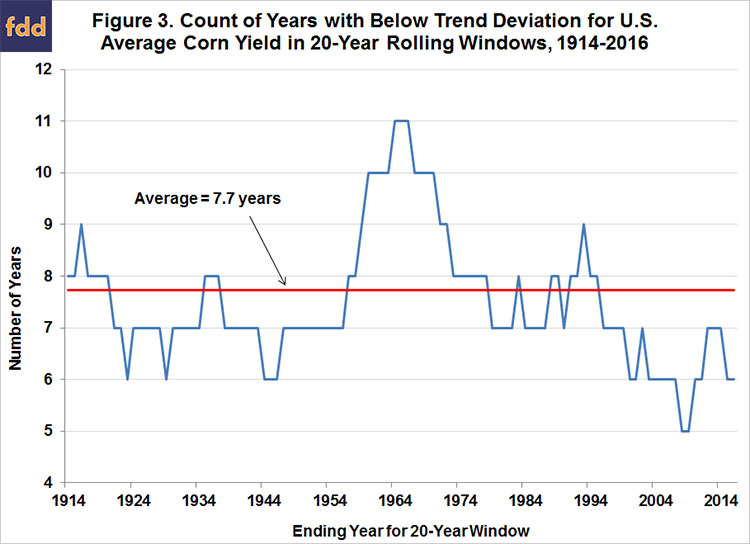 We calculate corn yield trend deviations based on 20-year rolling windows since 1895, and find that yields show a below trend value for an average of 7.7 out of 20 years. The average cumulative value of the negative yield deviations during the 20-year rolling windows was 71.3 percent. While the frequency and magnitude of U.S. average yields below trend value have varied considerably over the past 122 years, a clear pattern of reverting to average trend values is shown in the data. The reversion to average trend contains no obvious pattern and occurs after varying lengths of time above or below average trend. The recent pattern has been for less frequent and smaller negative yield deviations than the long-run average. In fact, the sum of negative deviations for the 20-year window ending in 2016 is among the smallest of all possible 20-year windows since 1895. This reflects the fact the U.S. essentially has had only one truly bad corn crop (2012) since 1996. The only other comparable period of benign weather was the late 1940s through the late 1960s. History suggests that a period of more frequent and larger negative yield deviations than that experienced most recently can be expected in the future. History, unfortunately, does not provide many clues for predicting the exact timing of the transition. Good, D., T. Hubbs, and S. Irwin. "Are There Predictable Crop Price Cycles?" farmdoc daily (7):105, Department of Agricultural and Consumer Economics, University of Illinois at Urbana-Champaign, June 7, 2017.